Force carbing with multiple kegs. I will have a dual regulator with a 4 line manifold on one side and a strap fgt shot on the other side. I plan on keeping 4 homebrews on tap and a keg of somethin cheap like pbr. So to force carb one keg and still serve out of the others can I simply turn off the gas flow to all but one keg then up the pressure on that keg then turn off the valve to that one and back off the pressure to serving pressure an open the other valves back up leaving the higher pressure in one keg? I figure some of the pressure will dicipate once the beer soaks up some co2 but I could do this a couple times so I could keep serving my other beer. Would this work or should I just hook up the co2 at serving pressure for a certain amount of time? 1) Split one of the lines for the manifold so you can serve everything off of that manifold and regulator, using the other regulator for carbing only higher pressure carbing only. The drawback here is you'll only want it on higher pressure for a couple days to a week max or risk over carb. 2) Do what you said, but honestly that sounds like a pain. 3) Do the set it and forget it method, hook em up at normal pressure and in a couple weeks you'll have perfectly carbed beer. I do option 3. But i have a second regulator I use on a second tank and i carb at 40 psi at 65 degrees. one regulator is always set to serving pressure. if you keep it consistent you have less trouble holding a solid pressure. if you are always messing with it you may have trouble getting consistent pours. the second regulator is the one i futz with. i turn it down for moving beer around between fermenters and kegs or to purge / clean stuff. then after everything is transferred i ramp it up to 35psi and blast the fresh kegs with gas while i give them a good shake. i do that a couple times then disconnect the qds and shove them in the fridge. i usually hook them up to serving pressure the next day. following that procedure you should have perfectly carbed beer in approximately 1 week. This seems like an expedited method of what I suggested. Just pressurize and disconnect. it's both easier and better since it's likely that you will be adding kegs to a system that already has a couple that have been on gas for a while. 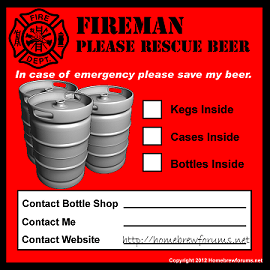 changing the pressure that those kegs are on will cause them to foam potentially. How do you hook up dual regs to one co2 tank? Or is that not the case? I have two regs, one co2, but only have one hooked up. I am almost done w/my keezer build, and am facing this same problem. The port on the reg opposite the tank is a high pressure port. Meaning you can hook up another reg there or a high pressure gauge to read the tank pressure. Basically the picture in Lothos' last post, but with two gauges. the far right or left side hooks to the tank. i had two single regulator setups, i removed the CGA adapter from one (usually on the right hand side) and the plug on the high pressure side (usually on the left hand side) of the other, and using a left hand threaded pipe, attached the two together.